Overwhelmed? That Can Be Easily Remedied, Really! Have you noticed that you've been feeling overwhelmed recently? Maybe it's more like you've been feeling overwhelmed for a while. Don't worry, I get it, I've been there too. I've been learning techniques to help with that funky feeling. It might sound funny, but sometimes you just need to put one foot in front of the other foot. 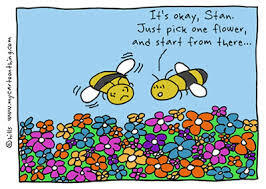 Or choose one flower and begin there. I can hear what you're thinking… "But I don't have any idea which direction to go in so I can't do that!" This week I worked with a new client. Over the past year she had helped three of her loved ones transition. During that time, she neglected herself and all the ways she usually took care of herself. She was feeling completely unenergized, deflated, uninspired and had no focus, like her tank had been drained. No wonder, it was empty. The only thing she did on a regular basis was beat herself up with critical judgments about what she was not doing. She told me that she had so much work stuff in her house that needed to go outside but she couldn't make herself do it. So, being me, I had a brilliant idea! I decided to go out and help her. I had no idea what I was in for! I arrived at her house and was greeted by a guy with food on his face. That wasn't a problem. When he invited me into the house I was greeted (or grunted at) by a pig. Yep, a pig. Maybe it used to be a potbellied pig, but this guy was large! My client and I went outside to take a look around and assess what needed to be done. I asked her where she wanted to start but she had no idea. She thought maybe we would plant some flowers. I knew that flowers would look nice but she'd still have all that clutter in her dining room. When we went back into the house, that pig had gotten into my purse and had eaten (kind of) three lipsticks and devoured my lip gloss. Oh well. We began in the dining room. the only thing is that this 8 foot long table was completely filled with stuff. Below it were dozens of crates, mostly filled. She also had a lounge chair completely covered with more stuff. I don't think I've ever seen so many things in one place. I watched her deflate as I started talking about what we could do. It was obvious that she was just too overwhelmed to think about it. I'm tricky - I asked her what would be the easiest thing to start with. And the door opened and our work began. Bit by bit we went through what was on the lounge chair first (it was a smaller task than the table.) Before long it was cleared of everything that had been sitting on it for months! When her daughter came home from school she was happily shocked and sat upon the chair! Then we methodically worked on the table. From start to finish, we worked for 2 1/2 hours. By the time we were done the table was cleared off too. Things were given away, trashed or ready to be sold. Sometimes it just takes the right inspiration to turn what feels like a monumental task into something that gets completed. It also helps to have the right people working with you.